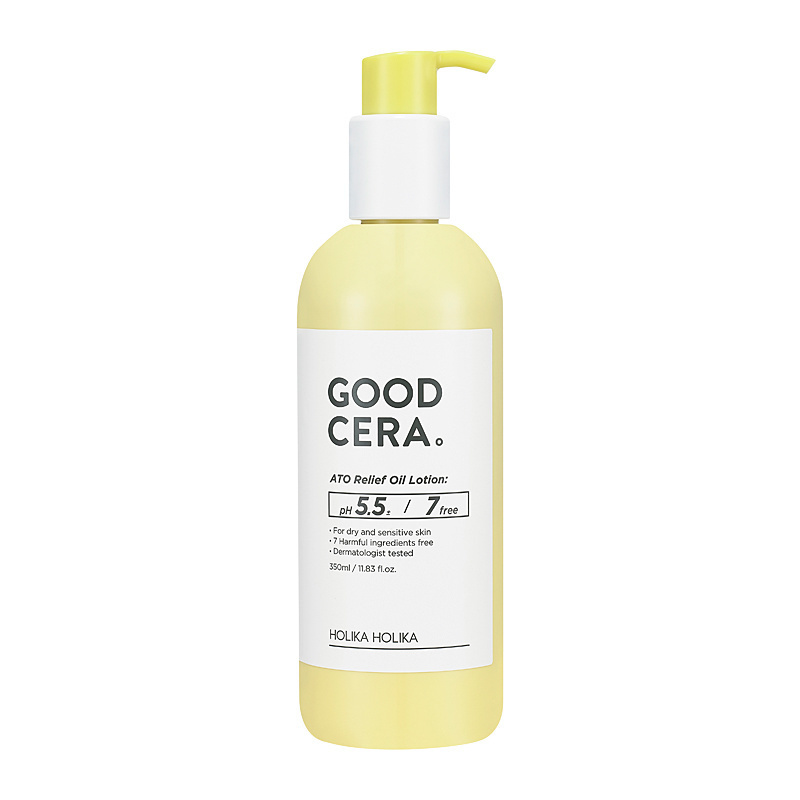 Holika Holika Good Cera ATO Relief Oil Lotion is a wonderful care for your body! The lotion contains ceramide complex. This ensures that the skin is hydrated, protects against harmful influences and feels elastic. The lotion works deep into the skin and restores the skin and reduces irritation and redness. 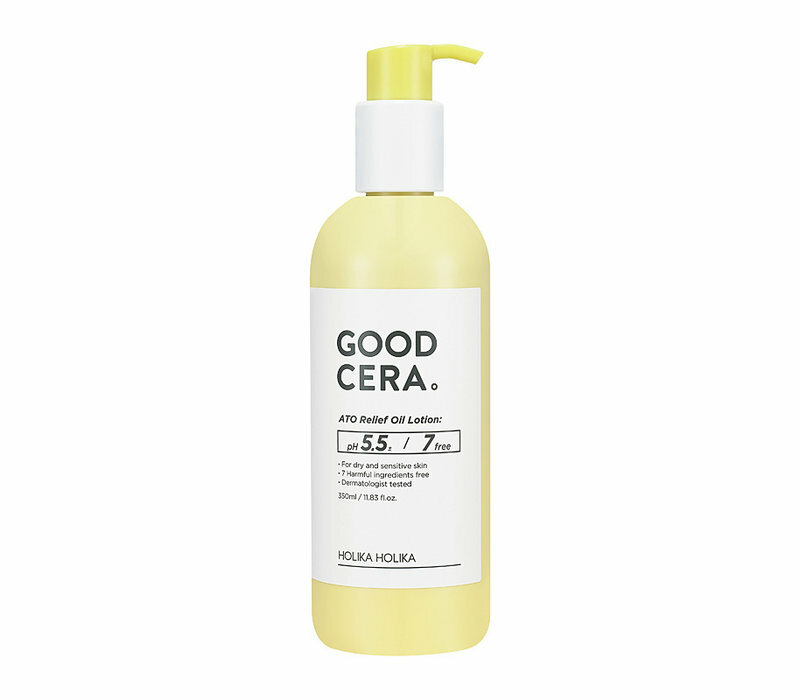 The acidity of pH 5.5 ensures optimum moisture content in the skin. This body lotion contains no artificial colors and is fragrance free. Suitable for sensitive and dry skin. Apply the lotion to dry and cleansed skin, preferably after showering. Gently massage into the skin and leave on. Water, Glycerin, Ethylhexyl Stearate, 1,2-hexanediol, Cetearyl Alcohol, Phenyl Trimethicone, Propanediol, Polyglyceryl-3 Distearate, Methyl Trimethicone, Glyceryl Stearate, Centella Asiatica Extract, Ficus Carica (Fig) Fruit Extract, Butylene Glycol, Allxyl glycerin, Allxyl glycerin , Glyceryl Stearate Citrate, Aloe Barbadensis Leaf Extract, Althaea Rosea Flower Extract, Amaranthus Caudatus Seed Extract, Ulmus Davidiana Root Extract, Monascus Extract, Sodium Stearoyl Glutamate, Disodium Edta, Carbomer, Arginine, Argania Spinosa Kernel Oil, Camellia Camellia Seed Sinensis Seed Oil, Helianthus Annuus (Sunflower) Seed Oil, Macadamia Integrifolia Seed Oil, Olea Europaea (Olive) Fruit Oil, Simmondsia Chinensis (Jojoba) Seed Oil, Hydrogenated Lecithin, Caprylic / capric Triglyceride, Ceramide Np, Stearic Acid, Ethylhexyl Isononanoate, Phytosteryl / isostearyl / cetyl / stearyl / behenyl Dimer Dilinoleate, Glycine Soy (Soybean) Sterols, Hydroxypropyl Bispalmitamide Mea, Meadowfoam Estolide, Cetearyl Glucoside, Hydrogenated Polydecene, Glycosphingolipids, Butyrospermum Parkii (Shea) Butter, Ceteareth-20, Glyceryl Citrate / lactate / linoleate / oleate, Ceramide Ap, Ceramide Eop.